Daily Illuminator: Color-A-Munchkin And Win An Exclusive! October 12, 2016: Color-A-Munchkin And Win An Exclusive! There's a certain art to being a munchkin. 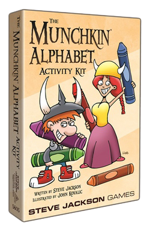 And now there is actual art, with the release of our Books-A-Million exclusive Munchkin Alphabet Activity Kit! This new kit contains The Munchkin Alphabet Coloring Book and 10 new Munchkin cards, as well as six colored pencils, three black-and-white bookmarks, and a mini-poster, to work on your doodling skills. And we're celebrating the release with a special contest! Entering is easy – simply print this sample page from The Munchkin Alphabet Coloring Book, make it a masterpiece by coloring inside (or outside) the lines, and share it on Facebook, Twitter, or Instagram with the hashtag #ColorAMunchkin. Not only will you be sharing your artistic interpretation with the world, you'll be entered to win a copy of The Munchkin Activity Kit, signed by Steve Jackson (yes, that one)! Three winners will be chosen randomly (one from each social-media channel). Please, only one entry per person. The contest ends on October 18, 11:59 p.m. Central time. So break out your best art supplies and show us your take on Spyke and Flower!